We spent a total of 8 days in Warsaw, our longest break from travelling since staying with friends in France at the end of May. We were in part seduced by luxury, for our friend Nick has a flat – or more accurately, a penthouse – in a new block near the centre, with a glorious top-floor terrace and panoramic windows, which was ideally suited for sorties into the city, and a comfortable base for relaxing too. In part too I (Rob) was seduced by this city, which I have visited before but never had the chance to explore to this extent, and it became increasingly fascinating the more time we spent there. Nick gave us a warm welcome, and the first two evenings were spent in fine restaurants serving high quality versions of traditional Polish food, washed down by a good deal of wine and vodka (giving us the first real hangovers in a long time!). After that though we had a few days in the flat on our own as Nick was away on business, and we shared another couple of evenings together when he got back the following week. We visited many of the most famous parts of the city together, and on other days, while Lesley got on with some writing in the flat, I (Rob) went out on my bike to delve deeper into a few more off the beaten track parts of the city. First a little bit of history about the city. Its heyday as a seat of power and wealth was between the 16th and 18th centuries, as the royal capital of Poland and then the Polish-Lithuanian union. This finally came to an end in 1795 when Poland was carved up between the emerging Russian, Prussian (German) and Austrian empires, and Warsaw came under Russian rule. A Polish state only re-emerged in 1920, to be snuffed out once again by the evil duet of Hitler and Stalin in 1939. There had been a Jewish community in Warsaw for centuries, as in most Polish towns, and before the Second World War around a third of the population was Jewish, with a vibrant cultural and economic life that was an integral part of the flavour of the city. Two episodes in particular during the Second World War conspired to change the face of Warsaw. The first was the incarceration, in 1940, of the city’s Jewish population in an overcrowded walled ghetto in the centre, followed by their torment and extermination in a story that is already well known. In April 1943 Jewish fighters mounted an armed uprising in a desperate last attempt to resist the Nazi occupiers who were sending the imprisoned population to the death camps. 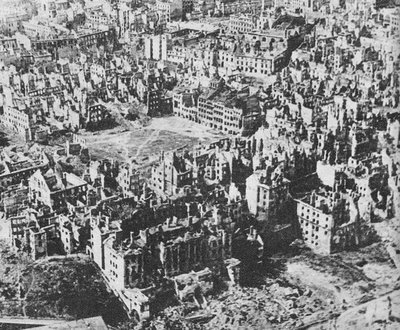 The ghetto uprising ended in tragedy, with all but a handful of Warsaw’s Jews killed, and parts of north-central Warsaw razed to the ground. The second was the ‘Warsaw Uprising’ of August 1944, when underground units of the Polish army rose up against the Germans in the hope of liberating their capital, with, they hoped, some support from the Red Army. The latter was not forthcoming and tragedy was the outcome here too. Tens of thousands were executed in revenge, and Hitler gave the order to destroy anything and everything that was important to the Poles. 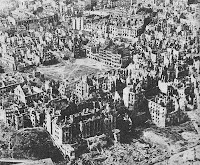 The Royal Palace, much of the Old Town, as well as numerous other landmarks, were dynamited to rubble, and the rest of the city set to the torch by the German forces before they retreated. Many of the important historic buildings had therefore vanished by 1945. However, the new Polish state put enormous resources into rebuilding the historic quarters, essentially the Old Town, the New Town (itself pretty old, but less so than the Old Town) and the Royal Way streets. It may seem ironic that a communist government restored a royal palace, but it happened. The results were a minor miracle, and these areas are still stunning to this day, with a period feel that completely belies the young age of much that you now see. The Old Town is the place I (Lesley) had heard about from reading other people’s travel blogs. Everyone heads for there, and you can see why. The post-war reconstruction faithfully followed photographs and paintings to rebuild the whole area from the skeleton remains of cellars and a few walls. In doing so Warsaw was given back its enormously attractive historical centre of merchant’s houses from the 15th to 17th centuries, complete with patterns painted on the exterior walls and, in some cases, quite a bit of gilding. It had the usual tourist gifts, artists sketching your portrait and some restaurants geared to a tourist menu, but none of it was over-done or in your face. We wandered on into the streets of the New Town - ‘New’ only by comparison with the Old Town, being originally built in the 17th and 18th centuries. This was too a post-war reconstruction, but strangely enough, the sixty years since the rebuilding have done a lot to age the buildings, making them look no different to buildings of their supposed age all over Europe. Adjoining the Old Town is the so-called Royal Way (Trakt Królewski), one long street called at first Krakowskie Przedmieście (‘Krakow Suburb’ as it lay on the Krakow road) and further down becoming Nowy Świat (‘New World’). 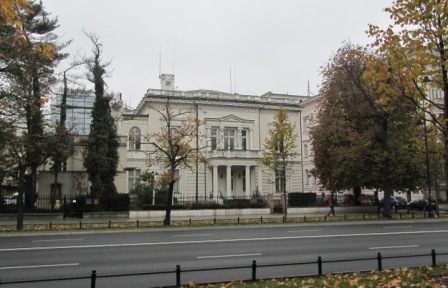 The streets are lined by carefully restored 18th century townhouses, with a concentration of grander buildings at the Old Town end – the Presidential Palace and Warsaw University to name but two. They have the same historic feel as the Old and New Towns, but have a busy commercial and street life that keeps them part of the modern city, as opposed to the rather preserved-for-tourists feel of the former. Nowy Świat has a busy café and restaurant scene, and we indulged in cheap pierogi (like ravioli, but in the shape of small Cornish pasties) at a bar mleczny, which is a sort of self-service canteen doing traditional home cooking. You choose from a list on the wall though, and so you have to know something about Polish food or you take pot luck. A reasonable lunch for two, including maślanka (a yoghurt-like buttermilk drink), came to about 16 złoty (£4.50). Our friend Nick wouldn’t be seen dead in one of these “milk bars”, but we rather like them, having first come across them twenty years ago on our first visit to Poland. We were surprised at how well endowed with parks Warsaw was, and the sunny autumnal days of our visit lent them a golden glow. There are such spaces all over the city, some of them remnants from old estates with little trace of their original buildings. In the Saxon Gardens there are some sandstone statues in a Rococo style and some arches which are now part of the Tomb of the Unknown Soldier, which are all that is left of a once grand palace. Another set of leafy parks are situated all along the escarpment above the river Vistula, just a stone’s throw from the crowds on the Royal Way but entirely unsuspected by the casual visitor. Warsaw is much more than just the Old Town and Royal Way though. No visitor can fail to notice its highest building and surely few can walk past it without humming the theme tune to Ghostbusters. The Palace of Culture and Science is a 195Os skyscraper in Stalinist wedding-cake style, which rises in narrowing tiers above the Warsaw skyline. Regular readers of this blog will get déjà vu, as it is a dead ringer for the Academy of Sciences in Riga (see the ‘Latvia’ blog entry for pictures). Not an exact clone, for the Warsaw tower is larger, and has many more outbuildings at its base. Statues around the walls evoke a Greco-Roman feel, putting the stress on the classicism in ‘Stalinist neo-classicism’, while the roof decorations are positively gothic, and take their inspiration from 16th century styles of Polish renaissance architecture. It was the vogue for a long time to slate this building, as it was imposed by an uninvited foreign power, but I (Rob) find it a magnificent and inspiring piece of architecture. If you reject architecture because of its sponsors, then you must surely reject Roman amphitheatres and temples, and many Renaissance palaces which were also built by foul regimes and individuals. The other triumph of early communist reconstruction is to be found a little further south, lining the southern end of the long Marszałkowska Avenue. A huge new residential area was to be built here, known by its Polish acronym of MDM, with at its heart a new oblong square called Plac Konstytucji (‘Constitution Square’). This makes a grand public space, with its confident stone buildings and high arches and arcades, and is on a par with many 19th century squares in European cities. Just beyond the square on Marszałkowska stand some of the best socialist-realist reliefs you are likely to see, of the idealised workers, soldiers and mothers of Soviet mythology. I thought some had particularly Polish faces. Not all of Warsaw was razed in the war. Elsewhere in these southern districts there are many fine older buildings to be seen, from the numerous minor palaces of Aleje Ujazdowskie, through the elegant villas of Mokotów and Ochota, to the many small art nouveau flourishes on apartment buildings, which are becoming more apparent as the façades are cleaned and repainted. In the northern city centre, two monuments to the Warsaw Uprising and the ‘Ghetto heroes’ recall the savagery of the 1940s here. Of the ghetto area itself nothing still stands and nothing has been reconstructed, and the district is now occupied by anonymous post-war slab-style housing blocks. I (Rob) visited the newly opened Uprising Museum, and was captivated for three hours by the displays on the background, the events and the follow-up to the uprising of 1944. It was only opened in the last few years, which might seem a bit late, but the uprising was rather a taboo subject in communist Poland. Put simply, the uprising was organised by the ‘wrong’ resistance, the non-communist one, and the post-war regime clung to the lie that the defeat of fascism was down to communists alone and tried to besmirch the reputation of any other contenders to that claim. Warsaw is a city of monuments, and in so many of its squares communist statues have been replaced by resurrected pre-communist figures, or by new memorials to the non-communist resistance and the victims of communism itself. Like Poland as a whole, Warsaw is looking much better now than in the early 1990s. People look better dressed, the shops are full, and in both these areas the differences between east and west are no longer apparent. Buildings are cleaner and brighter, and new ones (of good and bad design) replace some of the empty gaps and decrepit old hulks that dotted the city centre 20 years ago. Of course it is not universally good and, as in many large cities, some people are still reduced to scavenging or begging, but fewer than in the shock days of economic transition in the 1990s, and it looks like the hard times are gradually receding into memory. Personally, I (Rob) rather miss all the little kiosks that crowded the city pavements and formed the backbone of shopping in those days, and regret the arrival of the big multi-national chains – TK Maxx, Marks and Spencer, Carrefour etc – but I guess that is the price of integration into the European mainstream, and it is a clock that few would turn back. It was a real wrench to leave Warsaw. We enjoyed the city’s hustle and bustle, its cafes and milk bars, its architecture and its history. We also appreciated the comfort of Nick’s apartment, but Greece was calling and to get there we need to travel, so we left on Thursday 21st October heading south-east along the banks of the Vistula.